Information Management and Technology Assurance includes information about emerging IT trends, IT risk and IT assurance, data analytics, security and privacy and business solutions. The word “blockchain” has been tossed around as if all blockchains are the same. Real-time access to information, increased transparency and encryption are standard benefits of any blockchain. However, there are two different types of blockchains: public and private, both of which are important for CPAs to understand so you can decide which option is better for your organization or firm. The idea of a public blockchain is what most people think is, and what technology purists would consider, the “real blockchain.” Completely decentralized and open to any individual or institution to join (known as members in blockchain parlance), the most well-known example of a public blockchain is the one that runs Bitcoin. While a purely public option does include many of the benefits associated with blockchain technology, these same attributes can make implementing a blockchain less than ideal for business purposes. By allowing anyone and everyone to join a public blockchain, the approval and consensus process can take too long for it to be it useful for the volume of daily transactions. And depending on how data is approved, the electrical cost can be too expensive for practical use, considering the sheer volume of information processed by most organizations. Cybersecurity is becoming a critical issue as consumers increasingly entrust their most confidential information – including Social Security numbers, tax identification numbers and financial information – to companies that store this data electronically. 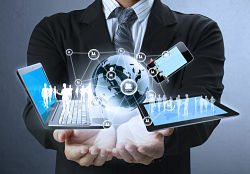 As companies look for third-party assessment and verification of their cybersecurity risk management program, CPAs are well-positioned to provide these services – and the more comprehensive definition of attest that many states have adopted ensures that only CPAs can provide cybersecurity attest services in accordance with the AICPA’s high standards. Attest services are those services that are limited to licensed CPAs and can only be performed by licensees through CPA firms. They include audits, reviews of financial statements and examinations of prospective financial information. Open the newspaper, and you’ll find no shortage of stories about sensitive corporate information getting into the wrong hands. How can you ensure this doesn’t happen to your organization? Solid IT policies and procedures. They are critical components of an organization’s umbrella IT strategic plan and are designed to prevent serious operational problems. In general, security policy and procedures include assessing your organization’s assets and holdings, evaluating them against threats or risks for exposure and having the right tools and techniques in place to manage those threats and risks. What were you doing at 7:32 p.m. on April 23, 2011? Chances are that Google, Facebook, Microsoft, Apple, your phone company and your Internet Service Provider know. If you share a computer, all of the other users may know. Your employer may know. As will the government, if it so chooses. And if this isn’t enough, they may even know where you were when you were doing it. Is this a problem? Well, that depends. Do you like getting bombarded with online ads and email obviously based on your recent surfing habits? Are you researching that perfect gift for your wife or husband, or planning a big surprise party? Perhaps you are pregnant or researching medical symptoms and don’t want anyone to know?